The Natural History Museum of Los Angeles is the largest natural history museum in the western region of the United States, containing artifacts covering a time period of 4.5 billion years, thereby allowing us to look back into the early history of theEarth. This museum holds a vast collection of specimens, which are used for display in regular exhibitions. It also features much in-depth research about many of the world's animals and plants, both living and extinct, enabling visitors to gain an understanding of how the world has changed over the millennia. This museum is located in three different premises across the city of Los Angeles. 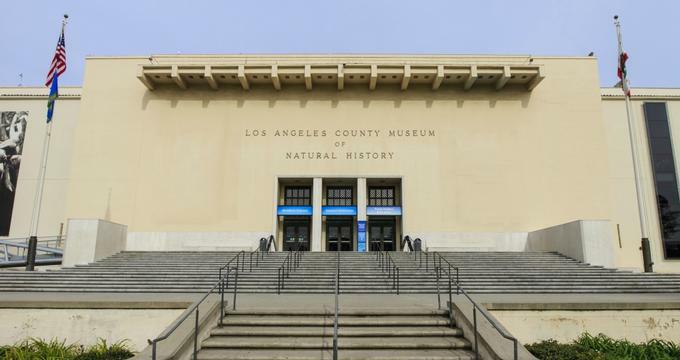 These include the Natural History Museum of Los Angeles County, the La Brea Tar Pits and Museum, and the William S. Hart Museum. All these museums were built between 1872 and 1910 on what used to be agricultural land. Thanks to the efforts of William Miller Bowen, the museum was officially established on November 6th, 1913. What Does the Natural History Museum Offer? This main focal point of the museum is its huge collection of animal skeletons,spanning back many hundreds of thousands of decades. These skeletal artifacts allow visitors to step back in time, giving them a chance to learn about the prehistoric animal inhabitants of the area. The main attractions that seem to excite every age group are the skeletons and fossils of the dinosaurs. While CGI and modern-day movies may bring these extinct reptiles back to life on the big screen, there is nothing quite like seeing the actual remains of a real-life dinosaur. When visiting the museum, you will have the chance to meet with some of the museum's archaeologists, who will provide you with detailed knowledge pertaining to the specimens on display. If up-front conversation isn’t your thing, you can learn many interesting details from the information plaques located in front of each specimen. Many museums are seen as being little more than old and dusty buildings full of boring collections, but the Natural History Museum will entertain, thrill, and educate even the most steadfast of museum critics. This museum plays a vital role in conserving and preserving more than 35,000,000 specimens, including live insects and bugs, animations of extinct species, and detailed collections of rare animals. For example, the African mammals collections includes exhibits on savanna elephants, Arabian oryx, spotted hyena, and hippopotamus. Delve into the secret lives of some of the world’s most elusive animals and understand the role that man is playing in both preserving and destroying these species across the globe. On your way out, you might want to stop off at the museum shop, where you can find plenty of strange and unique gifts and trinkets from junkyard dinosaurs, giant sequoia seedlings, and cuddly soft extinct animal toys to key chains, beetle earrings, and plenty of informative books. This museum is open 7 days a week from 9:30am to 5:00pm. It is closed on New Year’s Day and Christmas Day. Members gain free admission.The museum provides parking on a first-come first-served basis.